Online Appointments can be made up until 11:59pm the day before. Not all services can be booked online. We DO take appointments the Day of the Appointment – Just CALL us! First Haircut Ever? YES – you may book our First Haircut Package online – we allow XTRA time for an XTRA special Occasion! 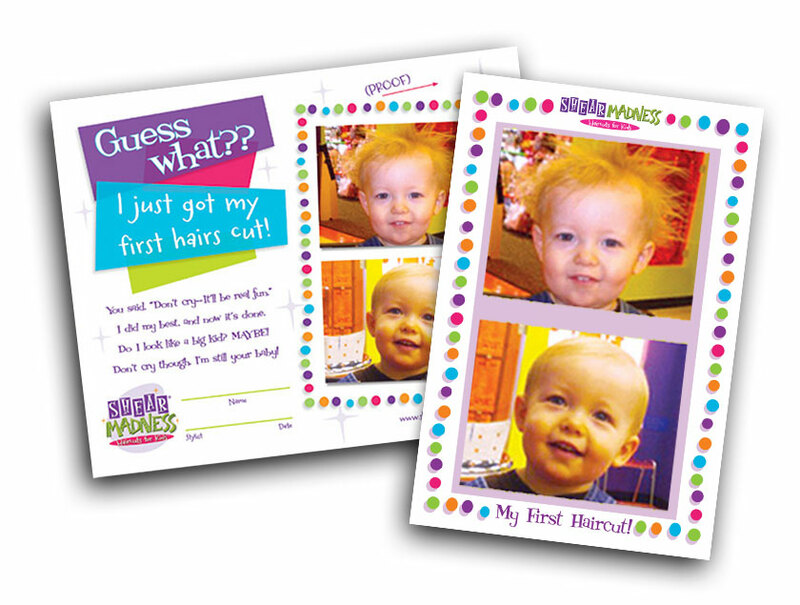 Includes an 8x10 Certificate with Before/After Certificate, Lock of Hair, & an additional 5x7 frame-able Certificate for an XTRA person! 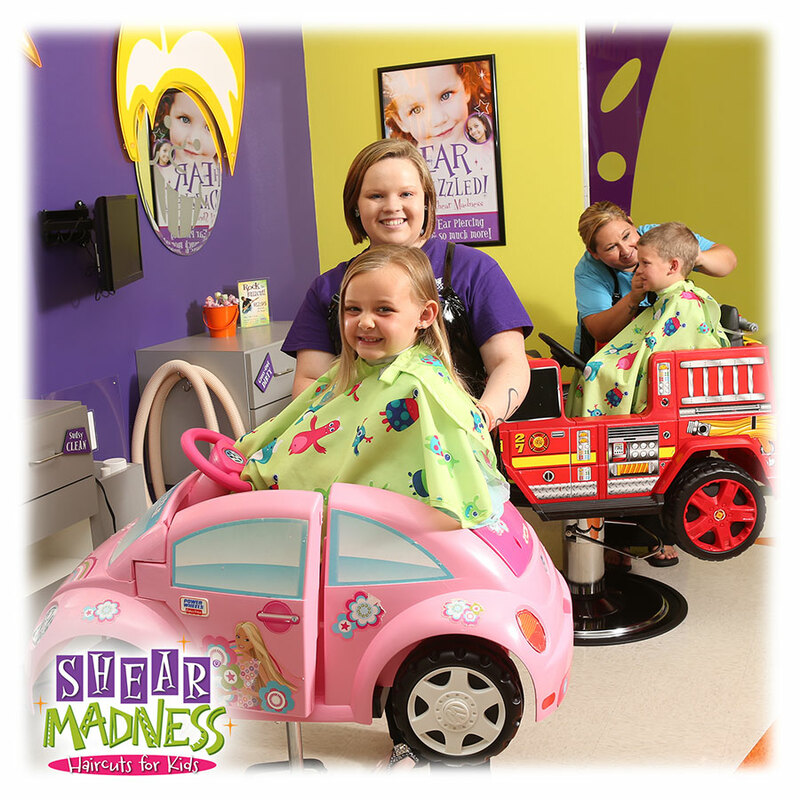 First Haircut at Shear Madness? YES – You may book online as well! If you have any special needs, there is a place for you to tell us! Daddy & Me Package? YES – And DAD gets a discount on his! Just book both separately as individuals and we will add the discount at checkout. Ear Piercing? YES – This is a 30 minute service, which includes a keepsake teddy bear, cleaning gel and certificate, all for the price of the earrings! Please expect a call or email with a few questions so we can make this the best experience possible for your child. Diva Days? YES – For that special girl! Fun Updo, Sparkly Makeup, Nails Painted, Tiara OR Glitter Tattoo. Birthday Parties? While we Do Birthday Parties – to schedule please CALL us! Think of a group all getting a Diva Day – ADD in Karaoke, Glitter Tattoos & Tiaras, Headband Party Favor & Keepsake Party Pic! Can’t get the time you would like? CALL us! Sometimes not all available times show up online. CALL us! Once this is fixed it won’t be a problem again! You may have enrolled your child under a nickname or a full name – just try again. There may be a duplicate name in our system. Unfortunately, we can only have one child per name in our system – but we DO have a work around – please CALL us for your first time and we will help you through it! We may have your child’s name spelled incorrectly in our system – if so, be sure to CALL us and we will get it fixed! 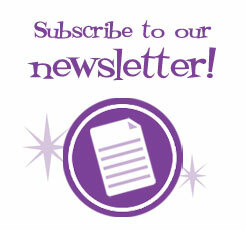 Sign up HERE for our monthly newsletter!! Get all the Shear Madness special announcements, exclusive savings, and helpful hints delivered right to your inbox!